We discovered Elfin Forest hike several years ago, and it became our favorite place to hike. The Way Up trail gives a 600 foot elevation gain, enough to get your heart pumping for a good workout. 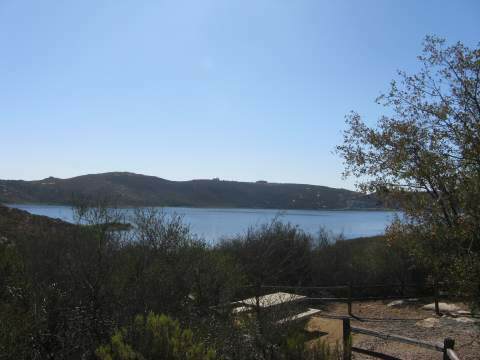 The trail is mixed use, with some San Diego mountain biking enthusiasts and horseback riders using the trail to access the trails higher up around Olivenhain Reservoir. There are 11 miles of hiking, mountain biking, and equestrian trails, and primitive picnic areas and scenic mountain viewpoints. Enjoy the 150+ different native plants in the oak riparian, oak woodland, coastal sage and chaparral areas. This is best for small groups. Permits are required for groups of 8 or more people or horses, or 4 or more bikes. The Way Up Trail starts with a bridge crossing the creek (shown 2 pics above), then heads up a dirt trail that quickly becomes sunny. We hike this trail all year around. In the summer it is best to go early before it gets too hot, as you will be in the sun most of the time. You many encounter horses on the trail, so please give them the right of way. I don't recommend this trail for small children, as they usually don't like the hike up. Kids prefer the shorter botanical loop, exploring the creek area, and checking out the living roof in the visitor center. 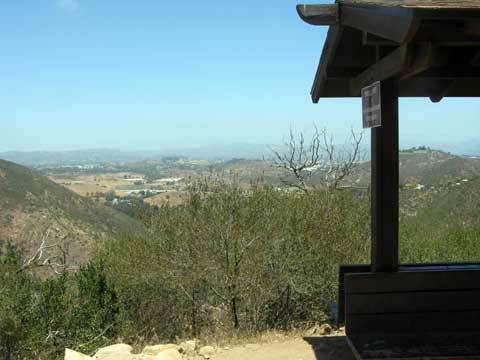 After a one mile hike up the Way Up Trail, there is a rest area at the Harmony Grove Overlook, where you can see a nice view of Harmony Grove in Escondido CA. If you continue up the trail another half mile, you will come to the Ridgetop picnic area (shown in the picture below). There are also many other trails to explore up here, and they are less crowded. The Botanical Trail extends for about 0.6 mile, then connects to the Way Up hiking trail, for a total round trip of about 1 mile. This is a nice alternative for younger children, and botanists of all ages. You can pick up a trail guide which points out 27 items of interest on the trail, in the chaparral, coastal sage scrub and riparian habitats. You will need to cross a creek on the rocks (see image below), which is fairly easy except after heavy rains, when you should use the bridge at the Way Up Trail instead. 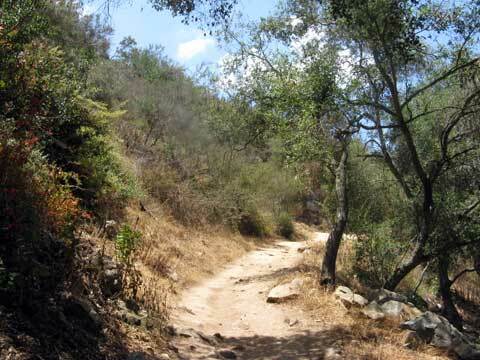 Elfin Forest Recreational Reserve is a popular San Diego hiking trail park located in Escondido, CA just northeast of San Diego The Elfin Forest preserve offers spectacular hiking, views, and nature trails in San Diego county. The area is also popular for horseback riding and mountain biking in San Diego. Operating Hours: 8:00 a.m. and is open every day of the year except Christmas Day and rainy days. Closes about 30 minutes before sunset. Things to Do: - Hiking, mountain biking, horseback riding, photography, visit the Interpretive Center, walk the Botanical Nature trail, cool off in the shady creek, enjoy a picnic lunch. Parking: Free. There are two small parking lots. The first one can accommodate horse trailers and is close to the Interpretive Center. The second one is an overflow parking lot. Parallel parking is also available on Harmony Grove Rd. Food: Bring a picnic lunch and plenty of water. If you bring your dog, there is a hose and watering trough at the top of the Way Up Trail at the Ridgetop Picnic Area near the overlook of Olivenhain Reservoir. Dog Rules: Dogs must be leashed at all times on the Way Up Trail, lower hiking trails, and at all times on Saturday, Sunday and Holidays. On weekdays, dogs are permitted off leash but only at the top of the Way Up Trail (point marked with sign). Hazards - Poison oak is common within 20 yards of the creek, so be careful if you wander into the brush. Diamond, southern Pacific and Speckled rattle snakes live in the park. Pets traveling off-trail are most susceptible to bites, so please keep your dog on the San Diego hiking trail. 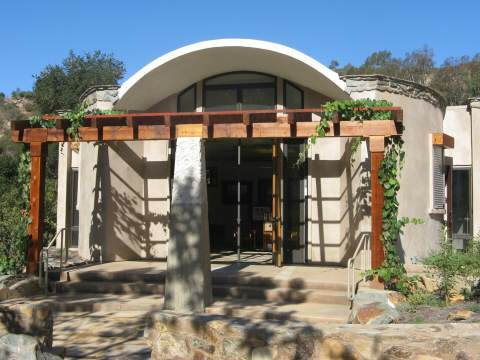 While visiting the preserve, be sure to check out the Elfin Forest Interpretive Center, an interesting building with a living roof. This is a great place to bring the kids and the family, to see green alternatives. 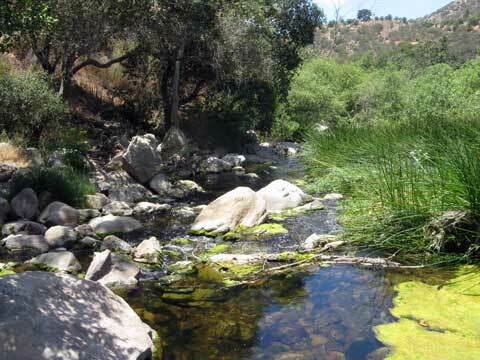 It is located in the main parking area, a short distance from Escondido Creek and the entrance to the Way Up Trail. 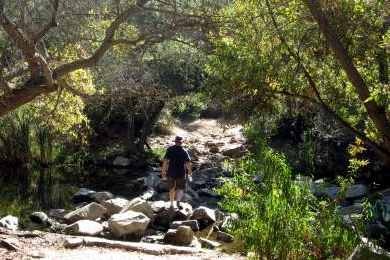 Directions to Elfin Forest Recreational Reserve - From Interstate 5 in Carlsbad CA (north of San Diego), go east on La Costa Ave. for 4 miles, left on S. Rancho Santa Fe Road for 1.7 miles, right on San Elijo Rd. for 1.5 miles, right on Elfin Forest Rd. for about 6 miles (becomes Harmony Grove Rd). The Reserve is located between the 6 and 6.5 mile markers on Harmony Grove Rd. Turn into the first parking lot on the right, and if full, try the second lot or park along the highway. Parking lots can be full by late morning on popular weekends and holidays.